Monitor your IBM Spectrum Virtualize(SVC)- or Storwize Cluster 24/7 by defining a wide variety of alerts for matters such as configuration errors, performance issues, SAN problems and capacity usage. Explore your volumes workload by viewing or printing out visual representations of a vast amount of performance and capacity history about your primary storage resources in html5/svg-based graphs in 5-minute intervals. • Number and state of your storage systems and external storage. • Overview of your total capacity(available, allocated and utilized). • capacity history and threshold breaches for both pools and volumes. • State of your current alert configurations and entities affected. ... all in in one view. 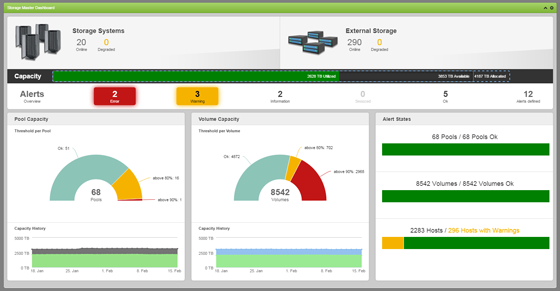 The entry point on WSP is the Status page, a highly configurable widget-based dashboard. The Status page can be set up individually for each user. Depending on the users interest area or what he or she is responsible for, the relevant Widgets are placed and configured for that particular need on one single screen providing an immediate overview of the installation. Widget settings can be stored as collections, and shared with colleagues. All Widgets link to detailed reports in the ”Object View” section. With the performance overview page you get a quick insight into which hosts, volumes etc .are utilizing your overall resources. This can be a good indicator in a troubleshooting scenario when performance starts to drop, as you will quickly be able to see what elements of your system are ”stealing” resources from the rest. Wizards for Virtual Storage provides a wide array of historical data presented in many different charts. In the example below you can see the cumulated growth of the two storage systems allocated and free during the last 6 months and the growth of the specific clusters in percentage during the last 90 days. Information such as CPU load is also displayed on a ”per node” basis giving you a good indication of how much pressure your systems are putting on your nodes. 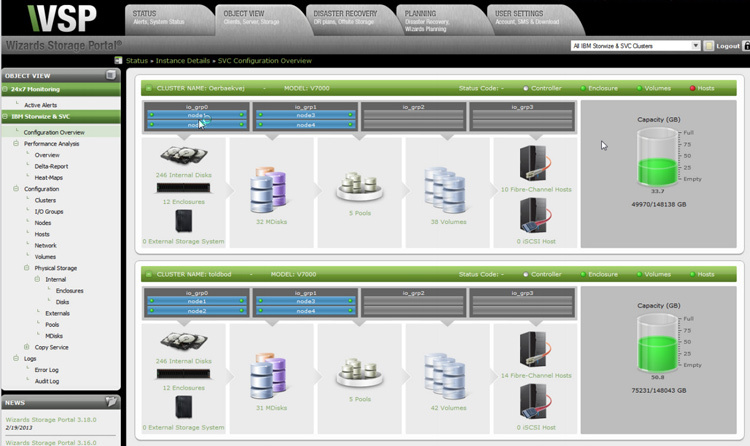 Wizards for Virtual Storage (IBM Virtualize - SVC & Storwize Family) provides a quick overview of all the components managed and serviced by your system. From this view you are able to drill down to different areas that may have caught your interest. The config overview gives you an snapshot of your clusters and their connected entities such as IO groups, enclosures, MDisks, Volumes, Hosts and capacity utilization etc. In WSP you are able to see the load on different ports giving you a great opportunity to load balance your host creation manually on the ports, thereby getting optimal performance out of your investment. 10 By selecting Storage Pools you can easily see which pool has the lowest utilization and therefore you are able to manually create your volume in the best pool possible, helping you to get the most out of your system. 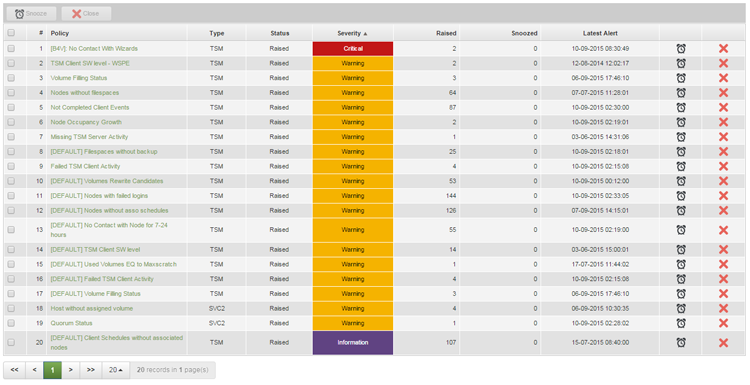 The Audit log gives a clear picture of all configuration changes to the system. It is a particularly useful tool in connection with IT revisions as the log shows what changes were done when, where and by who. 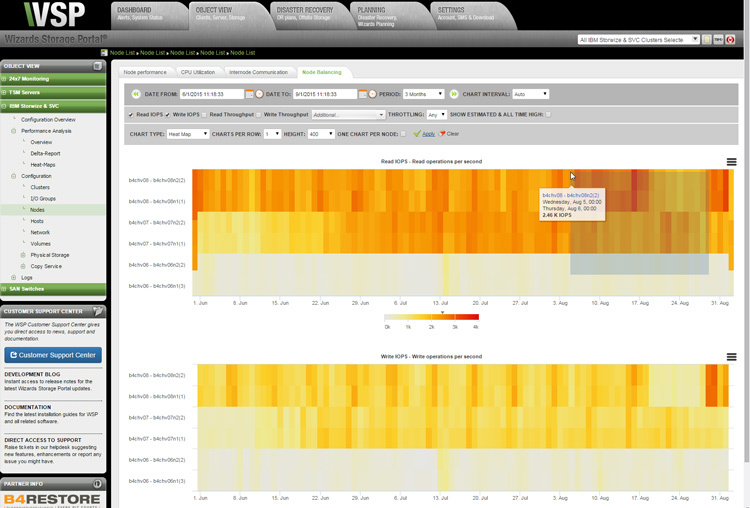 The Heat Map report in Wizards for Virtual Storage visualizes the workload across volumes or hosts that relates to one or more storage pools. This allows you to pinpoint exactly where the storage hot-spots and dead volumes are located and then decide whether a volume should be migrated to another pool, freeing up bandwidth or capacity for the remaining volumes. For example, you could create a storage pool for high capacity/low performance hard drives and another for high performance/low capacity SSD drives. If the high performance drives are reaching capacity while the high capacity drives are remaining idle you will want to ensue that the right activities are allocated to the appropriate storage pool.